Warning: This novella was originally a part of the Touch the Dark Box Set. All rights have been reverted back to me, and the book has been revised. 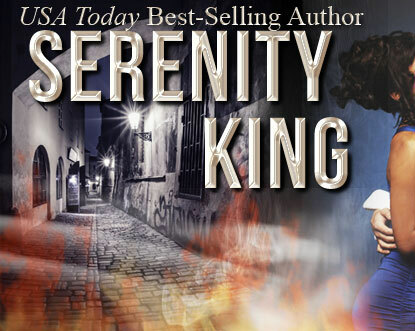 "From USA Today Bestselling Author Serenity King comes something new and exciting! In this fast-paced story of chaotic good vs chaotic evil, vampires and shifters collide in a world of winner takes all, and at the center of the battle is the woman who has captured the hearts of the two men who have nothing to lose but everything to gain. Will Nylora give in to what she knows in her heart is the best choice for her, or will she let the unforgettable passion awakened in her override all that is good and right. Serenity King is perhaps best known as a writer of contemporary, sensual romance, but with Nylora’s Fate, she truly shows her range as a writer who can tackle any genre and make it her own. From the opening sequence to the very last page, this short but sweet tale is filled with non-stop action and heat! Nylora’s Fate is Book 2 in the “Unleashed” saga, and it promises to be the scorching beginning to a dangerous and tangled love affair where the outcome can be anyone’s game. To the victor goes Nylora. Get your copy today!"